Just Jingle: With Sprinkles, Please! Hello, friends! It's time for another new challenge on the Simon Says Stamp Wednesday Challenge Blog! This week we want to see you MAKE YOUR OWN BACKGROUND! You can use stamps, ink, dies, papers, or whatever your little heart desires to create a masterpiece of your own! The Design Team is using products from the ever fabulous My Favorite Things this week! You don't have to use MFT goodies to enter, but we would LOVE to see them if you have some! I used the SUPER cute Donut Die-Namics sprinkles die to create my background. I simply ran it through my Grand Calibur multiple times in different spots to create a fun, sprinkled-fulled background! 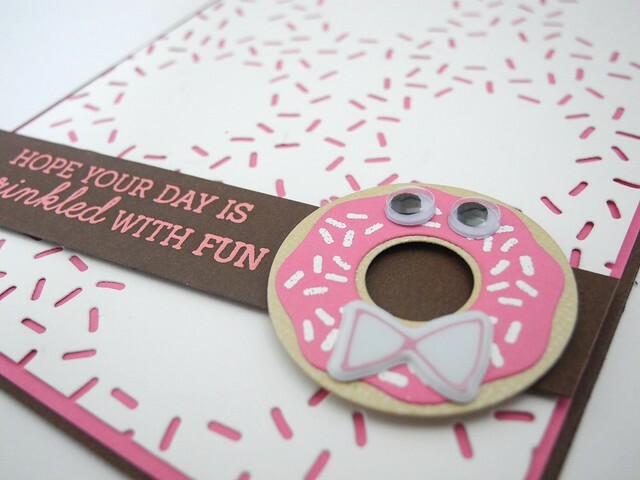 I then used the MFT Donut and Sprinkles stamp set for the sprinkles on the little die cut donut and the sentiment. This set is TOO MUCH FUN, you guys. For reals, though. Naturally, some googly eyes and a bow tie were necessary. Naturally. Now it's YOUR TURN! One lucky participant will win a $50 Gift Voucher to the Simon Says Stamp Store! WHAT?! Yup. You know you want it, folks. You know you do. Simply create something fabulous (if you have some MFT, feel free to use it! ), and link it up to the Simon Says Stamp Challenge blog so we can come check it out! Adorable card Jennifer! Such a sweet layout!! What a cute card! Annnnd now I want a pink glazed doughnut lol. Just pure fun, Jennifer! LOVE your card! Ha ha ha!!! So awesome!!! I would have been disappointed if there were no google eyes or bow ties on the doughnut - whew! Ha! Just kidding, but I love them!! Fabbie background and awesome card!! This is kind of totally genius! The expression on the donut's face! I would never have thought to use the whole as his mouth but it's just too funny! Love the sprinkle background too! This is one of my all time favorites of yours! Had to click through and tell you that this card totally put a smile on my face!!! Cute! What a cute idea and donut. EEEK!!! This is so much fun! Love this!!! hello Jingle! super sweet card, luv sprinkles...yummy! hope you have a super duper weekend! Now you're just showing off!! What an inspired card - the background sprinkles look fabulous!! !